The Astro Orbitor ride rotates around a central stem, and you control your vertical motion. Fly high and you can get some of the best views of Disneyland in the whole park. In fact, other than the views, it's more or less like Dumbo the Flying Elephant - without the big-eared pachyderm. Astro Orbitor is also one of the prettiest rides in Disneyland at night. To get a picture of it without a tripod, find a trash can or something else to brace your camera. If you're using a phone cam, you may have to prop it up to get the right angle. Press the shutter release carefully to keep from jiggling it or use the shutter delay if you have one. We polled 147 of our readers to find out what they think about Astro Orbitor. 84% of them said It's a must-do or ride it if you have time. Location: Astro Orbitor is in Tomorrowland. Restrictions: No height restrictions. Children under age seven years must be accompanied by a person age 14 years or older. Seating: The ride vehicles look like small rocket ships. Riders straddle a bench and sit one behind another. The rocket ships are a tight fit for two adults. You have to step up onto the side and then down into the vehicle. The lever in front controls your rocket's up-and-down motion. If you're riding with the kids, you'll be more comfortable if you split up, one adult and one child per ride vehicle. Don't let the line fool you. Because it loads all 16 rockets before "taking off," it moves in spurts. This ride may be closed during rainy or windy weather. Astro Orbitor is great for kids. Find more rides for your children. The ride queue has no shade, and on a hot day, you'll feel like you've rocketed to the sun. Try to ride early in the day, or wait until dark. Astro Orbitor is a ride that's nice at night. Astro Orbitor is designed to look like planetary models that were popular from the 15th through 19th centuries. These days we might call the style steampunk. The Astro Orbitor rockets travel at 11 rotations per minute, which is an average of 1.2 million miles a year. There has been some kind of a rocket ship ride at Disneyland since the early days, and this one has changed names four times. 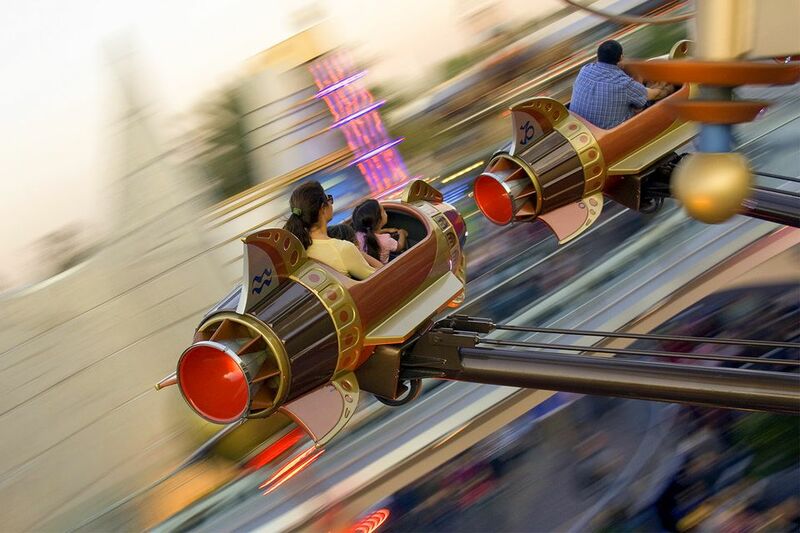 In Disney California Adventure, you can fly in a rocket ship on the Golden Zephyr.